TOKYO--(BUSINESS WIRE)--The SanBio Group, a scientific leader in regenerative medicine for neurological disorders, today announced the acquisition of a patent portfolio regarding cell medicines derived from mesenchymal stem cells (hereinafter the Patent Portfolio). The Patent Portfolio is pertaining to technology (hereinafter the Technology) discovered by Dr. Aline Betancourt, a researcher at Tulane University, that enhances anti-inflammatory and pro-inflammatory functions of mesenchymal stem cells (MSCs)*1 by stimulating specific Toll-like receptors (TLRs)*2 expressed on mesenchymal stem cell membranes while maintaining safety and tolerability profile of mesenchymal stem cells. 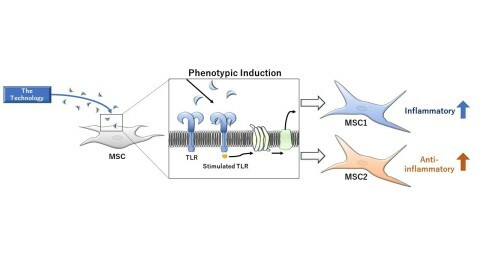 Mesenchymal stem cells induced to have enhanced anti-inflammatory function (MSC2 phenotype) and those induced to have reinforced pro-inflammatory function (MSC1 phenotype) using the Technology are more likely to migrate to injury sites and express higher homogeneity compared with naïve, uninduced mesenchymal stem cells, indicating their therapeutic potential as highly safe and effective agents. *1: Mesenchymal stem cells are multipotent cells that possess self-renewal capacity. They can differentiate into osteoblasts, cardiomyocytes, chondrocytes, tenocytes, adipocytes, and other cells that are part of the mesenchymal system. *2: Toll-like receptors recognize both exogenous (e.g., microbial and viral components) and endogenous (e.g., proteins released in response to tissue injury) danger signals. They are usually expressed on the membranes of sentinel cells such as macrophages and dendritic cells. Ten types of Toll-like receptors that recognize structurally different molecules have been identified in humans so far.